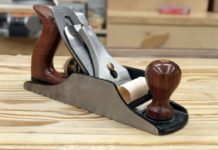 Woodworking has quite a few milestone moments or moments that you specifically remember for some reason. I remember when I made my first vise I felt like it was such a game changer. 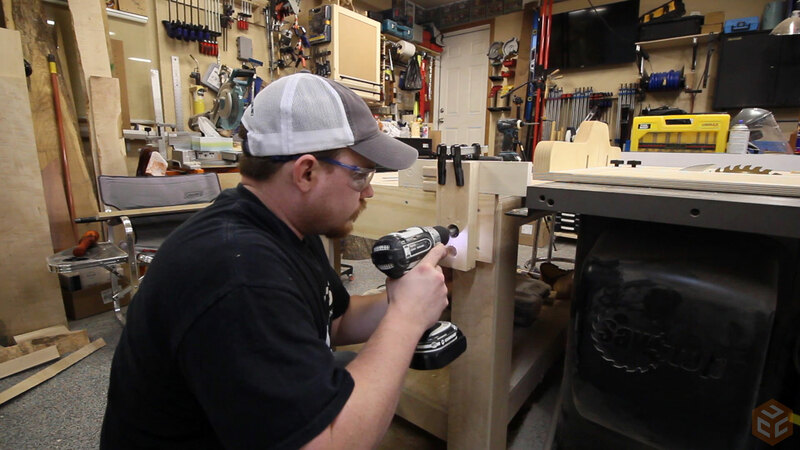 Not necessarily because of the vise itself but the new ability I had in my shop to firmly hold a piece of material in place for whatever task. I was so excited. That sounds silly, right? Well, yes and no. 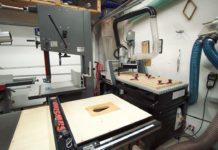 Up until that time I didn’t have a vise in my shop and everything I needed to do to any piece of material was done, most of the time, in frustration from that material wandering around on my work surface or from clamps being in the way and having to be moved frequently. 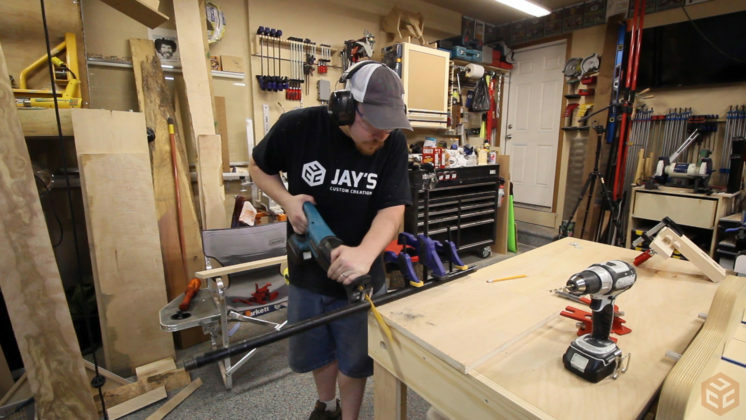 Fast forward to just before making this project and I’ve made a total of 5 vises, three twin screw (vise 1, vise 2, vise 3), one all metal vise, and one leg vise. This vise is my sixth vise total and fourth twin screw vise made from pipe clamps. Each one has been slightly different. For this vise I’m using 3/4” pipe clamps because that’s what we had on hand. 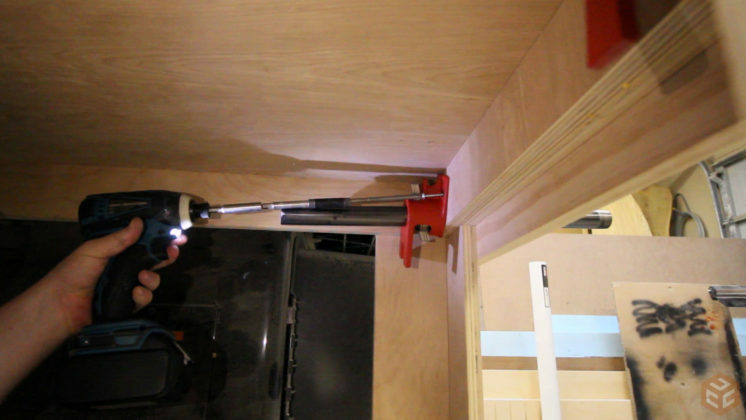 I prefer to use 1/2” clamps as they are less expensive and do the job just fine. I also used a 36” piece of black iron pipe, some soft pine for the fixed jaw, and a piece of hard maple for the movable jaw. 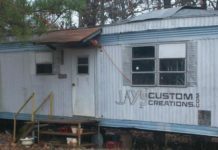 I’m also not in my shop for this project. April Wilkerson and I went to Wisconsin recently to collaborate with Nick Ferry on some projects. The table this vise will be built into is a sturdy plywood shop table made from one sheet of plywood. 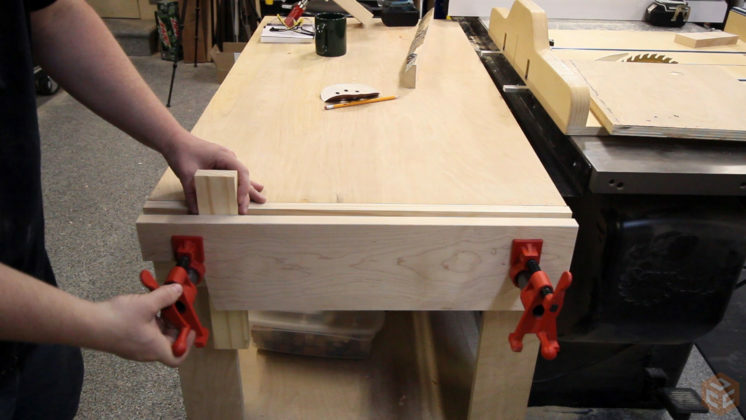 There are two characteristics that will really improve the user experience with the vise in regards to the table it is mounted to. 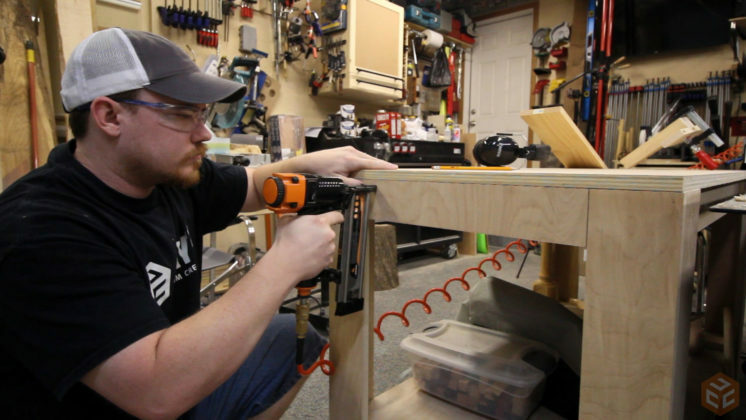 First, the more weight or mass the table has the less likely it will wander across the floor as you interact with the vise. Secondly, the table needs to be really sturdy. If the table is racking back and forth as you are sawing a board than that means it is also absorbing some of your energy which will make you work harder to complete the task. To make the rear jaw flush with the table I needed to pad the short rail of the table with one piece of 3/4” plywood. The rear jaw is going to be made from a piece of soft pine. No reason in particular for the wood choice other than we had a piece of scrap that was very close to the size needed. 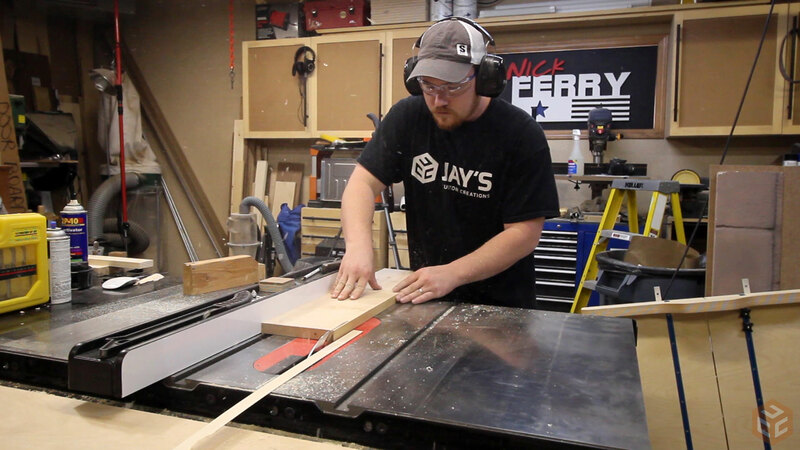 Just a quick crosscut on the table saw to size it. I didn’t want to permanently secure the rear jaw of the vise because I wanted to leave the option of removing it and relocating it down the road if needed. Now that I’m looking back on it it’s not that big of a deal either way. I secured the rear jaw with 6 screws only. 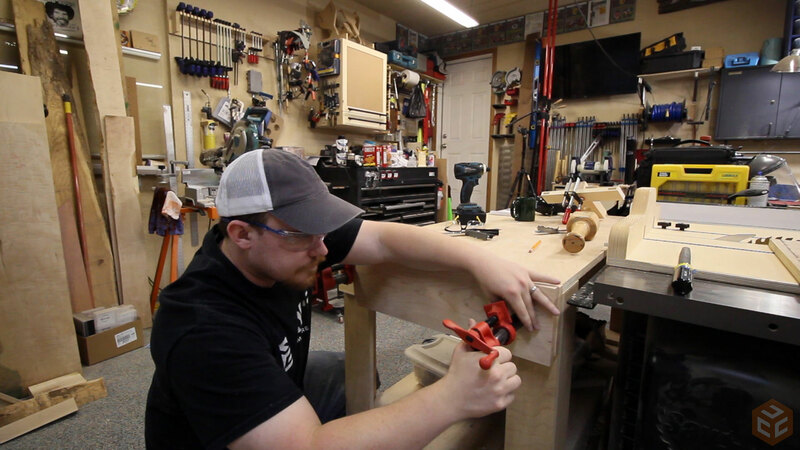 To ensure that both pipes were installed at the same distance from the top of the table I drilled a hole in a scrap block and clamped it to another scrap block to form a T. Then I could start each hole with the jig. And then finish each hole by eye. The goal is to try to be as horizontal as possible. 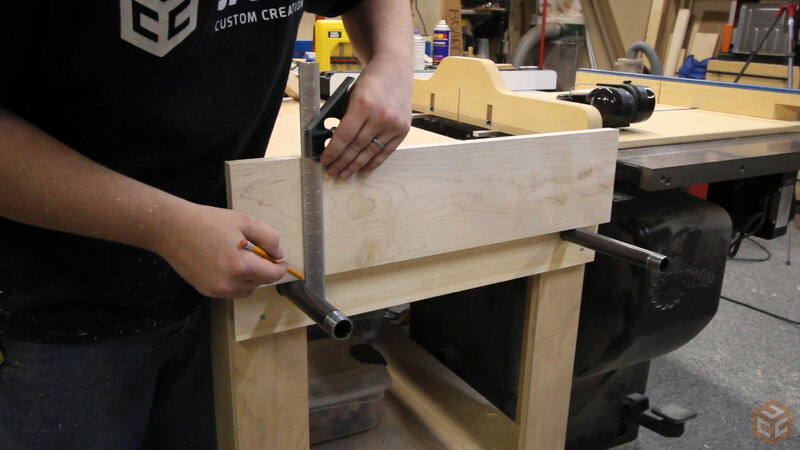 The rear jaws of the pipe clamps will be mounted to the inside of the table. Two mounting holes needed to be drilled first though. These are made from cast metal so drilling them is pretty easy. I cut a 36” black iron pipe in half to get two pipes for the vise. Black iron pipe has a messy coating applied to the outside that helps prevent corrosion. It isn’t needed for this application and just makes things messy so I removed the coating with mineral spirits and an abrasive rag. Finally the pipes can be installed. And secured from the inside with a couple of screws. From previous experience making these vises I’ve found that if you tighten these screws all the way you will most likely have binding issues with the pipes. 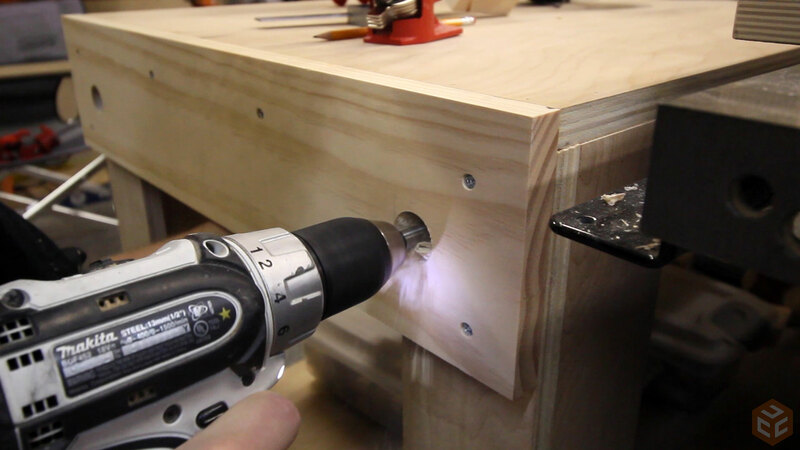 The only purpose of these screws is to keep them in place when you increase the clamping capacity of the vise so there is no need for them to be super tight anyway. Drive them down and then back them out by 1/8” or so. The front jaw was a piece of hard maple. I went with hard maple for this piece because it offers greater stiffness at a lesser thickness than a softwood such as pine. It was cut to size at the table saw. With the front jaw sized I used a square to transfer the locations of the pipe. I wanted to add a little more functionality to this vise. Having close tolerance holes for the pipes on the front jaw aids in limiting racking of the front jaw so I left one hole untouched. For the other hole I notched out the entire bottom corner so that it can swing up as needed. And with that done the vise can be completely assembled. 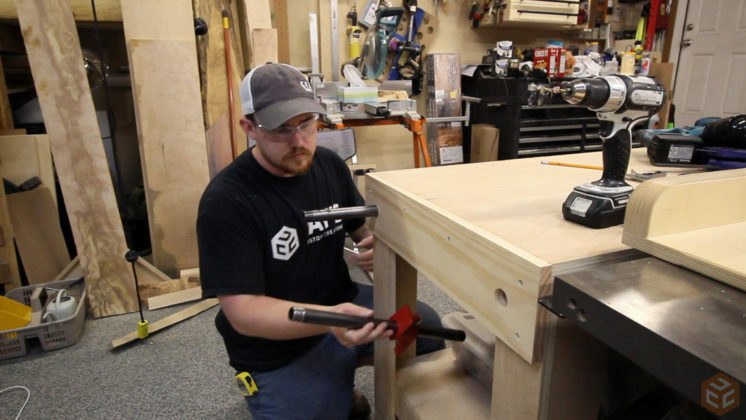 When using a twin screw vise like this it is best to work off of one side of the vise, especially when working with smaller material. In this example the right clamp is advanced about 1/8” further than the thickness of the material. From that point all you need to do is adjust the left clamp to firmly secure the stock in place. 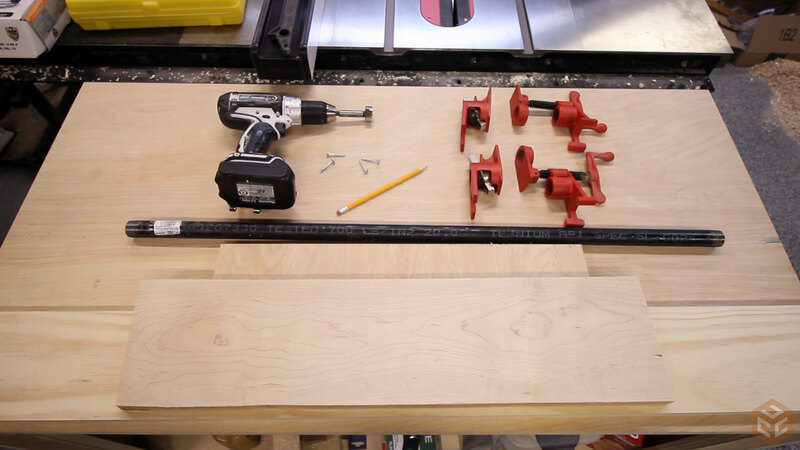 This makes interacting with the vise really easy as most of the time you only need to mess with one side. At the same time you also have the full capacity between the pipes which in this case is 18”. And lastly you can see how the front jaw pivots up to allow easy access for awkward shaped stock. The stock in this image isn’t awkward shaped. 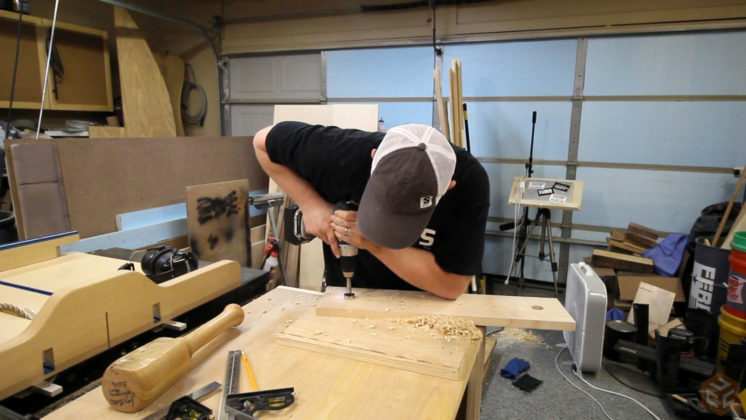 I was just demonstrating the use of the vise. Hopefully you were able to find this build useful and maybe got some ideas from it. Thanks for stopping by and have a great day. Perfect timing. Just built a shed to make room in my garage to do woodworking stuff. 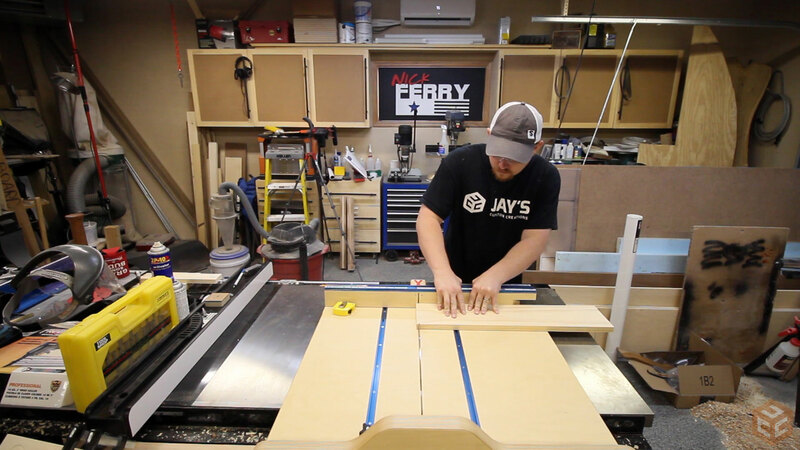 Just about to build a rolling table to put my router and chop saw on. This will be perfect on the end of said table. 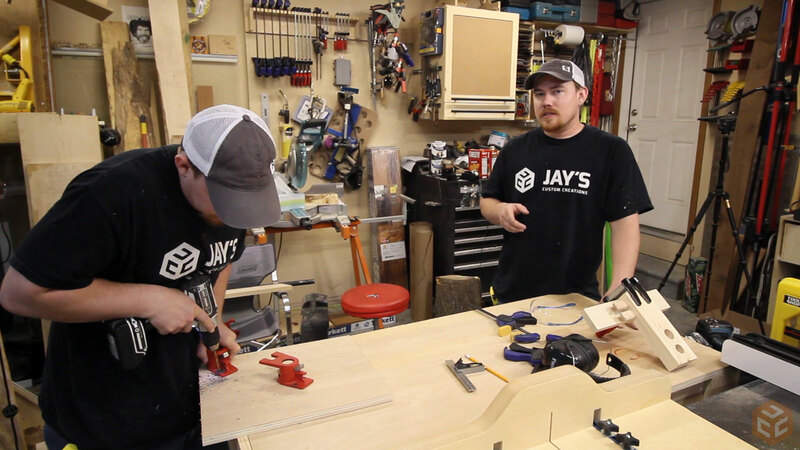 Jay, I’m a brand new woodworker and noticed you using a sled for a simple cross cut. What is the advantage of a sled in that case? I never could understand that. 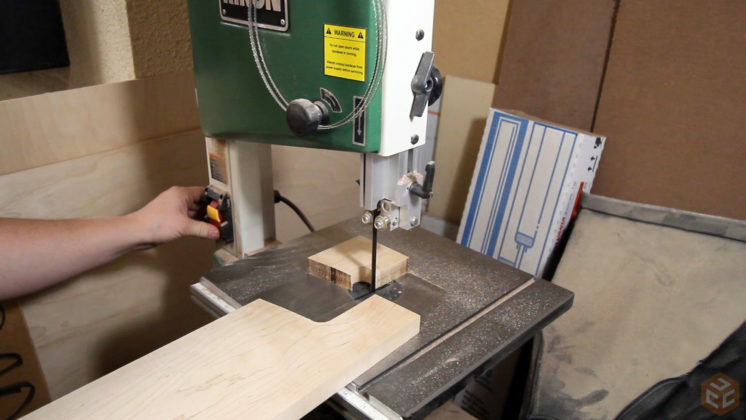 Thanks for all your help to us beginners..
7) sometimes the sled is used instead of a miter gauge or fence simply because the sled is already there, and it’s just easier than removing it and setting up the fence/gauge! Thank you for the reply, jaydub. 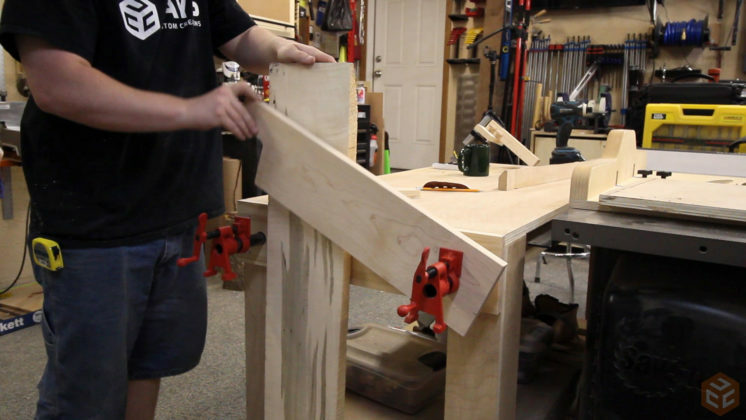 I keep meaning to build this vise set up since your video when you built the moxon style so it’s been awhile. 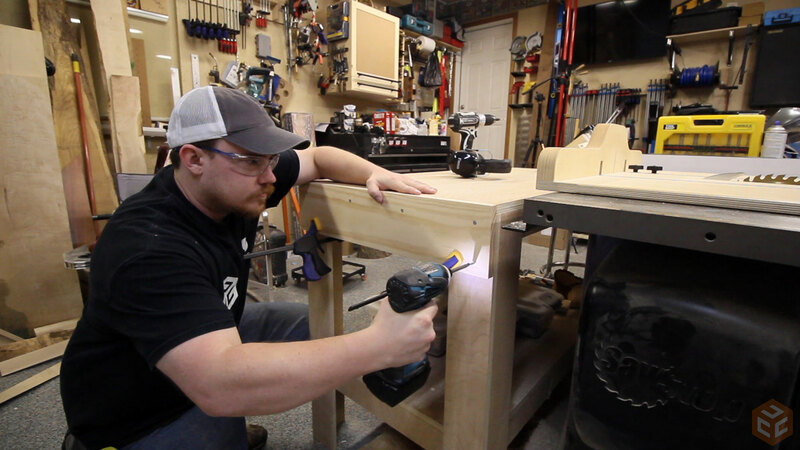 Now after watching this video I want to build two for my old bench until I build a Rubio style bench and then I’ll probably be building a third. Thank you for all the information and by the way my dust collection cart came out perfect from your plans. I must say that the plans are so well put together and easy to follow. Thank you very much for the feedback on the cart, Thom. I appreciate it and I’m glad you find it useful. Well done as always. I have two of your pipe clamp designs now and use them more than I ever expected. Side note….Love the collaborations with You, April and Nick. Search on Google for Pony Model 52-2PK. That has the sliding handle instead of the cast handle. It might be available at Home Depot. If not there are several online retailers that have it. By the way, that model is typically about $13 USD for 2 clamps. Wow Jay, this is a great idea. I am going to try this on the end of my work bench. Thanks for publishing this info. This blog is really interesting. I have bookmarked it. Do you allow guest posting on your website ?